Are you ready for some football? It’s time to make some delicious Tailgating Food! Preheat oven to 425º. Place a wire rack inside a large rimmed baking sheet. Place a metal rack inside a large baking pan. On a skewer, pierce one end of a strip of bacon. Pierce and place a tater top on top of the bacon, then pierce the same strip bacon again (to top the tater tot) to form a weave. Repeat with two to three more tater tots, depending on the size of your skewers. 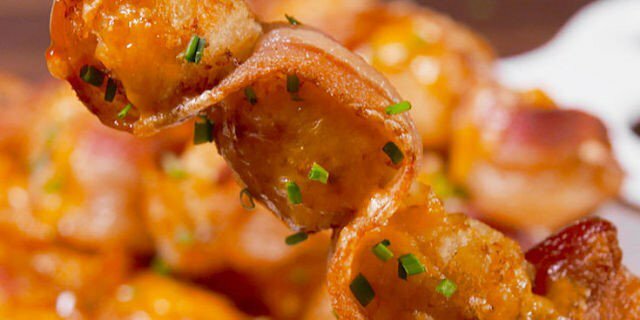 Repeat to finish the rest of the bacon and tater tots. Place on wire rack and roast for 20 to 25 minutes, until bacon is cooked through. Sprinkle cheese over the cooked skewers and bake until the cheese has melted, about 2-3 minutes more. Garnish with chives and serve with ranch dressing, for dipping.